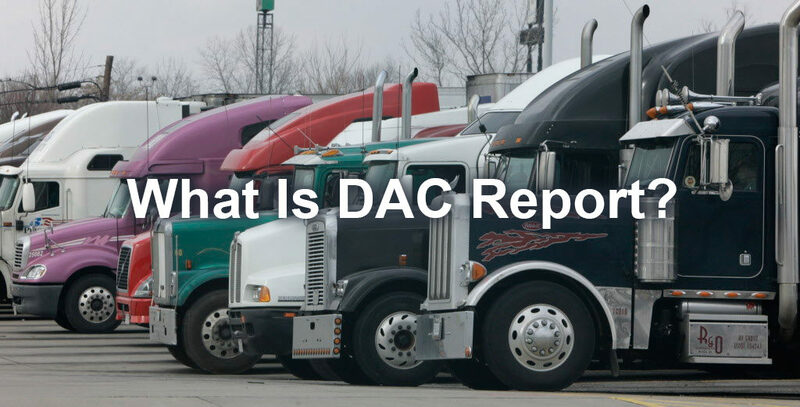 What is a Dac report. How to get a free DAC for truck drivers. How to file dispute for DAC for your truck driver job. How to fix your DAC. Even if you don't have a reason to believe there is any bad information on your DAC you still need to know what trucking companies are seeing about you. Who knows in a couple of months your company could go out of business or you get laid off. A Dac Report is a report complied by a company called HireRight Solutions, Inc., formally known as USIS Commercial Services. You may still see some material from USIC still floating around they are in the process of changing everything over to their new name. Trucking companies use your DAC (Drive-A-Check)to check on the work history of truck drivers. When you apply for a job as a truck driver the first thing prospective trucking company checks is your DAC . If there are any negative entries you will have a harder time finding employment. That is why it is so important for every truck driver to know what is on there DAC. And correct any bad information that maybe contained in it. Do you have a great story about this? Share it! Quality writers wanted: Join us! Click Here to learn more. Please feel free to leave any comments you have. There are two parts to your DAC report. The first is your motor vehicle report which is your driving record obtained from your home state. If a violation goes on your MVR there is nothing that can normally be done without an attorney. Reopening a case is very difficult and costly. It pays to contest every moving violation ticket because they stay on your record for three years and most companies require that you have no more than two non-serious traffic violations on your driving record. If you have two serious moving violations in a three years period means that your license will be suspended and you lose your driving job. CDL drivers can no longer take driving school or deferment programs like four wheelers can. It is getting harder to maintain a clean driving record if you are a trucker. The second part of the Dac report is your work history. This is information your former employers have reported. Trucking companies are paid a fee for your records. This includes listings about any accidents, noted as preventable or non-preventable, or other problems. Always leave your company on good terms. Never ever quit under a load or abandon your truck whether at your house or any other place. No company will hire you if they see an abandonment on your record no matter what the reason they will not take a chance on you. What your former employers reports about you means a great deal in trucking, and whether you qualify for a new driver jobs. If you have a recent preventable accident or a bad report from a former employer then you will have a problem getting any large company to hire you. It is very important to regularly check your DAC report. You have the right to obtain a copy of your report and also to dispute any incorrect information. This means they must verify any item that you dispute. Click here for information on stopping DAC abuse.. If the company confirms information contained on your DAC report it remains on your DAC report. You can try contacting the company directly and ask them to correct the report. If they refuse you may need to contact an attorney since most companies will simply ignore your request since it costs them to investigate and it is not in there interest. Always be polite and professional. HireRight is subject to the FACT Act file disclosure requirements. Upon request to HireRight, a consumer is entitled to receive a free copy of his or her DAC report once every twelve months. Additional copies may be provided within the twelve month period, subject to a $10.00 charge. There are other circumstances under which a consumer may be entitled to free copies of their file. HireRight only maintains consumer files for individuals who have applied for employment with their customers. As a result, your particular file may not be available through HireRight if you have not applied for employment with one of their customers. To request a copy of your report you must send them a written request including a copy of your Social Security card and Drivers License. This is the only way to get a copy of your report. Phone applications are not accepted. The report is of critical importance to drivers. It tells potential employers about you, and your work habits, carriers you have worked for, or whose orientation you attended, report on you to DAC, which places the information on your DAC report. The report contains your professional driving history including accidents/incidents, MVR record, drug/alcohol test history, plus criminal history. Approximately 90% of all U.S. long haul commercial carriers use the DAC Report for pre-employment screening. Inaccurate reporting and errors can easily end up on your report and they can negatively affect your ability to get work if not corrected. It is important that you regularly get a copy of your report because inaccurate information on your can keep you from getting the job you want or cause you to be terminated from the job you have just been hired. Carriers you have worked for, or whose orientation you attended report on you to DAC, which places the information on your report. Here are some key areas that you should watch out for. Orientations. Let's say you started orientation with a carrier but didn't like what you were hearing and left. You guessed it, that carrier can report on you even though you never collected a single paycheck. Unless your certain that you want to work for a carrier, do not submit to a pre-employment drug screen or attend the orientation session. Discharges. Try and leave companies on good terms with two week written notice. Most banks will notarize your letter for free. Just a handwritten notarized note of resignation can prevent discharged, load abandonment, and quit under dispatch, common negative items that can keep you from getting hired by other carriers. Drug History File Another area that causes big problems for drivers is drug test refusals and failures. Never quit after being asked to take a random test. Take the test, and then quit with written notice if at all possible. Any time you take a test, ask for a copy of the paper work showing you submitted to the test. Retain this in your records. Accidents/Incidents This is an important one. Don't report minor incidents where there was no damage or where you paid for minor damage straight out of your pocket. Seasoned drivers know the value of keeping a couple of hundred in cash for just these occasions. This can prevent an unsatisfactory safety record from being placed into your DAC report, in addition to the incident itself. Two incidents on your report will cause insurance carrier alarms to go off and lesson your chances of getting hired and increase your chances of getting terminated. Don't let a bad DAC Report hold you back! In order to better assist and inform consumers, HireRight has created this page to provide individuals with forms and instructions used: (i) to request a copy of consumer report information in our files (”Report”), including employment history information - sometimes known as a ”DAC report”; and (ii) to file a dispute regarding the completeness or accuracy of Report information in our files. In addition, information is provided to advise consumers of their rights under applicable laws, including the Fair Credit Reporting Act, and its amendments such as the FACT Act. It takes ten days to two weeks to receive your report. You can first try the 30 day removal plan of disputed items on the report. Just like a credit report, you have a right to dispute items reported on the DAC report and immediately request removal within 30 days if it is not verified. Click here for information on DAC repair your own.. The Federal Reporting Credit Act governs DAC which requires the HireRight/DAC to remove the unverified disputed driver information or DAC can be sued by the victim hurt by the unverified information on a report. The key point is that if disputed items cannot be verified within 30 days it must be removed permanently. If you dispute the fact that you were treated unfairly for whatever the reason, they have to prove it or remove the item in question. Their (DAC) 30 day window to verify or remove the disputed items on the DAC report starts when they receive your certified letter. Make copies of everything you send. Send by certified mail with return receipt on everything sent to DAC including the actual letter. HireRight will conduct an investigation, free of charge, if you believe information in your Report is incomplete or inaccurate. Before filing a dispute, you need to possess a copy of your Report that is no older than 60 days (in order to help ensure that you are disputing information currently maintained by USIS). Send an e-mail to consumers@usis.com and provide your name and phone number for a return call. Please note: HireRight is the new brand name for USIC Commercial Services and DAC Services. Have A Story or comment on DAC Report? Do you have a great story about this? Or just want to make a comment. Share it! We're seeking people like you who have in-depth knowledge about a DAC Report, a passion about that topic and a desire to share related insights with others. Ever see a article on the web and think I could write a better story or do a better job than that. Well here's your chance. Write an article on DAC Report or just voice your opinion. Hireright is a weapon used to murder a driver's careers.